We've been having problems with our camera again. Luckily we were still able to transfer pictures off of Laura's camera. One downside is that we've been using my camera as the primary camera, especially for food pics - so you won't get to see all the amazing food we ate in Italy until after we get back. Apologies again for the out of order pictures. We're about a month behind on blog updates - we're currently in Spain! 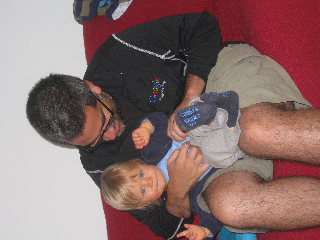 We had and great little break in Poland visiting our good friend Ela (and her 1-year-old son Sebastian). We did a bit of sightseeing, but we mostly just took it easy, hung out, went on walks, wrote the last batch of of posts and did our laundry. Sebastian's grown a lot since we last saw him - he's getting quite good at walking! The culinary highlight of Poland for us were the pierogi. Ela took us to a restaurant around the corner from her and we tried a whole bunch of different types of pierogi. My favorites were the ones stuffed with potato and cheese and the ones with sauerkraut. 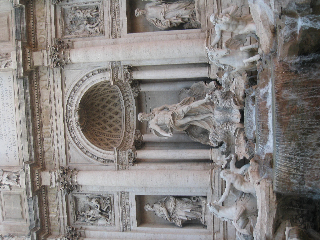 From Poland we flew to Rome on discount airline WizzAir. The flight was super-cheap (under $100 per person). We visited Rome 3 years ago so we only stayed in one night on our way to Val D'Orcia. Val D'Orcia is a picturesque area in southern Tuscany (and a UNESCO world heritage site). 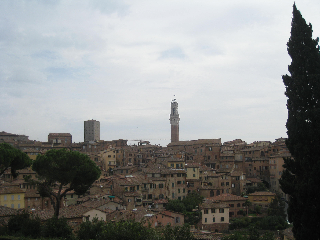 The most famous town in the area is probably Montepulciano. We stayed in a smaller town, Pienza, in an amazing airbnb (https://www.airbnb.com/rooms/207961). From our kitchen window we had a hillside view of the entire countryside. We bought some wine, sausage, pecorino (which Pienza is famous for) and ate by our window several times during our stay. We also did a lot of walking (to burn off some of those calories). 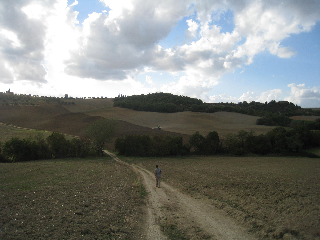 We were able to track our walk from Pienza to neighbouring San Quirico: http://www.endomondo.com/workouts/95311893. We happened to visit right after all the fields had been tilled, so there wasn't much more than dirt, but the views were still awesome. I can only imagine what it'd be like in the Spring when everything is green. 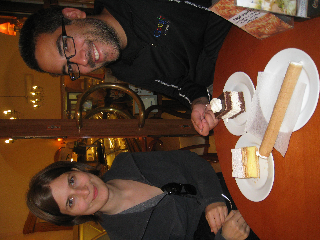 There was one restaurant in the town that we had read about before visiting "Latte di Luna". We ate there twice and the food was awesome. We particularly liked loved their homemade pasta, especially the pici ( http://en.m.wikipedia.org/wiki/Pici). I'll post pictures when we get back. 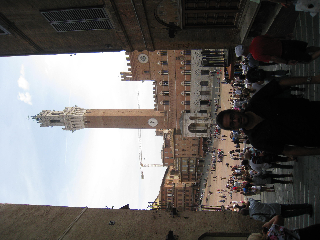 We took the bus and train from Pienza to Bologna with a stopover in Siena. Bologna is much less touristy than most of the other parts of Italy we've visited, but it's still beautiful. 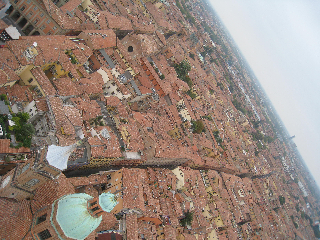 Bologna is a university town (founded in 1088 and still going - it's the oldest university!). We stayed in another airbnb. This time we were in a room in Eli's house. He had a couple other airbnb / couchsurfers at his place while we were there (a Russian girl, a guy from Australia, and a Canadian couple that took our room once we left). It was a fun experience - Eli was a great host. On the first night we arrived he was giving pasta making lessons to the other travellers and we joined in and sampled some of their squash ravioli (which was super-tasty). 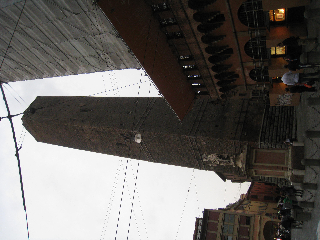 We left Bologna on a brutal 4:50 am flight to Casablanca (it was so early that we stayed at the airport that night. 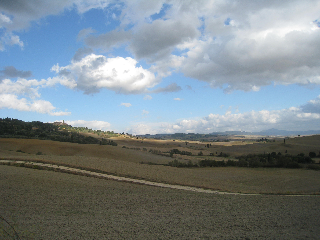 Freshly tilled fields of Val D'Orcia. Oooh...Val DdOrcia...jealousy!!! What's it like to walk through a real life Renaissance oil painting?!?!? !